Supermicro's servers offer numerous advantages over previous generations and other manufacturers. This includes the highest level of performance, efficiency, security and scalability in the industry, with support for the latest Intel® Xeon® processors for the highest performance. 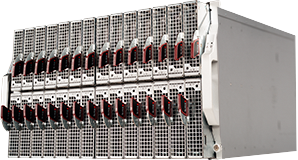 Supermicro brings servers offered in the industry’s broadest variety of form factors, including 1U, 2U, 3U/Mini-Tower, 4U/Tower, Mini ITX Box PC, 6U MicroBlade and 7U Superblade® adressing the widest array of product/market and application segments. The best selection of High-End Servers with uncompromising Quality Control bringing the best Price/Performance Ratio with redundant components and Superior Product Design. 1U up to 5U rackmounts, Towers & Twin Servers. The latest SuperServer product line designed to deliver unrivaled performance, flexibility, scalability and serviceability that is ideal for demanding Enterprise workloads. Offering many unique advantages that differentiate it from competitor's blade products. Maximum density, affordability, reduced management costs, lower power consumption, optimal ROI and high scalability. An entirely new type of computing platform. It's a powerful and flexible extreme-density 6U all-in-one total system that features 28 hot-swappable MicroBlade modules supporting 28x newest Xeon DP systems with Intel E5-2600 v3 family configurations. Supermicro SuperBlades and MicroBlades are very diverse and extensible. For configuration of these systems we advise you to contact our Supermicro experts.